When I picked Honey up from the hospital, actually I could see that she was much much better than the day before. She was sniffling around the carrier when I put her inside and started scratching the towel underneath. So it was a good sign! 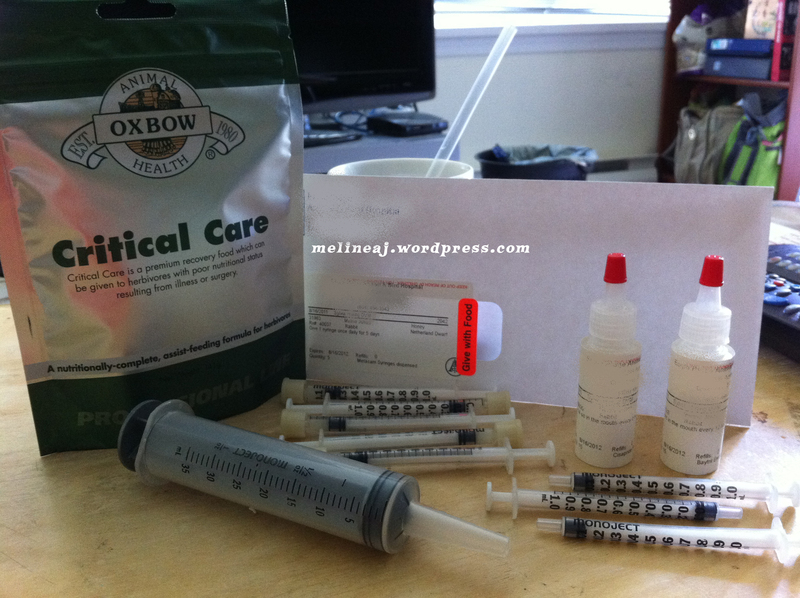 The doctor prescribed 3 medicines for Honey – that’s a LOT for a little rabbit 😛 I also bought the critical care formula, in case that she still doesn’t want to eat her regular food. So now, I’m still giving Honey her medications and trying to reduce the critical care formula to twice a day while introducing her to fresh veggies. Yes, I spent $10 on fresh veggies & fruits alone this afternoon (parsley, lettuce, broccoli, apple, and cantaloupe) just for Honey. Hopefully, she gets her appetite back soon, so I don’t have to force feed her anymore.